Zimbabwe finished designing its flag in 1980. The color green represents the fertility of our soil while the blue and white wavy lines symbolize the water that brings prosperity. Representing Great Zimbabwe stands for the nation’s historic heritage. The rifle (automatic AK) and hoe represent the transition from war to peace. The garland is formed of twisted strips of gold and green silk, and represents mining and agricultural enterprise protecting our national economy. This uses the ridge on which the star is an ancient symbol of hope of the future, red tinctured to remind us of the suffering of all our people and the need to avoid any repetition of that suffering. The star carries the great bird of Zimbabwe that has become our distinctive national emblem. Kudu in its natural colors displays a harmonious blend of black, white and brown that can be carried symbolize the unity of purpose of various ethnic groups comprising people of this country. The heap of earth carries the plants that give food and clothing to the people and the motto reminds us of our need to maintain a desire for national unity and will to work, to preserve the freedom we enjoy. In 1980 Zimbabwe finished designing its flag. 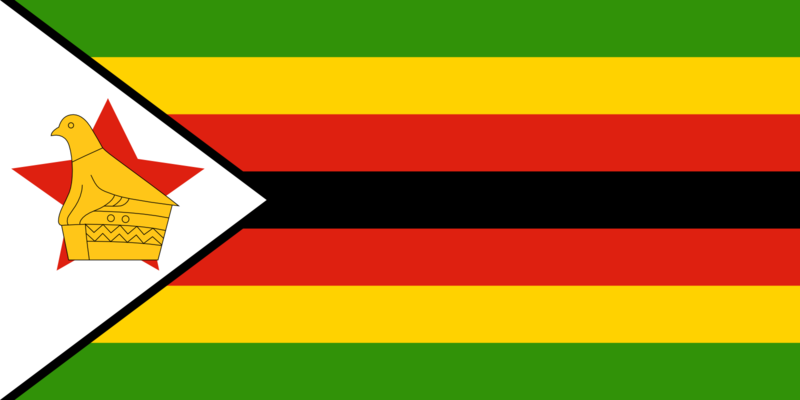 The Bird or national flag of Zimbabwe is represented in the flag like a statue, since that one was found in the ruins of Great Zimbabwe. At the end of the 19th century it served as the Zimbabwe national flag of the British South Africa Company, which repeats the symbol of the state of Great Britain, with the only difference being that it was applied to the emblem with the company’s initials in the stripes of the flag intersection. When the country became part of Southern Rhodesia, its flag was a blue flag with the British flag on the upper left side and the coat of arms with a green shield on the right side. This symbol of the country lasted until 1953, after which the emblem on the flag was replaced by the coat of arms, which symbolizes the union of the northern and southern parts of Rhodesia and Nyasaland.